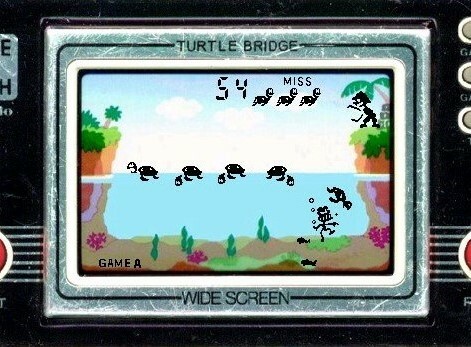 Before even the Game Boy, Nintendo had the Game & Watch games. These little handheld gaming machines were a serious addiction to me, and to this day they are such utter curiosities that if you haven’t played one, in its original form, then you’re doing yourself a great disservice. Of course, by modern expectations these games couldn’t even rightfully be called “games,” - a minigame in a Mario Party title, or one of those silly “verby noun” games like Flappy Bird or Crossy Road, have more depth to them than what the Game & Watch games had. Basically, each Game & Watch title was a small LCD screen, with “shapes” cut into it. Those shapes could be “lit” up with the liquid in the machine to display an image. By lighting the shapes in sequence, it was possible to create a very primitive kind of animation, where a specific “character” was perceived by the player to be moving across the screen (when in reality the shapes were just being lit up in sequence). Meanwhile, rudimentary programming allowed for some basic interactivity to happen. To use my favourite Game & Watch game as an example; in Manhole, you were required to stop pedestrians on two separate roads from falling into one of four sewers by holding a manhole under the space for them to walk across. The catch is, of course, that you’ve only got one manhole to work with. If a pedestrian “steps” onto a space without a manhole, they fall into the sewer. If that happens three times, it’s game over. For each pedestrian that safely crosses the road without falling in, players get a point. That’s it. That’s the entire game. Most other Game & Watch games were just as simple; Ball, the very first Game & Watch game, tasked players with juggling a couple of balls and keeping them in the air. Fire - the first really popular Game & Watch title, required players in control of a big rescue trampoline to bounce people jumping off a burning building into a nearby safe area. Oil panic required players collect and dispose of dripping oil inside of a building so it doesn’t land on the ground, and so on. They were the simplest of high score chases, and, really, once you worked out the patterns that the characters would “move” across the screen with, they were also ridiculously easy games such that failure was almost impossible. And yet I loved them. And they're incredibly important because, in their simplicity, they represent a creativity towards game design the Nintendo keeps core to its business to this day. When I was very, very young, my father would frequently travel overseas on business, and he would always bring back gifts for us all from his trips. 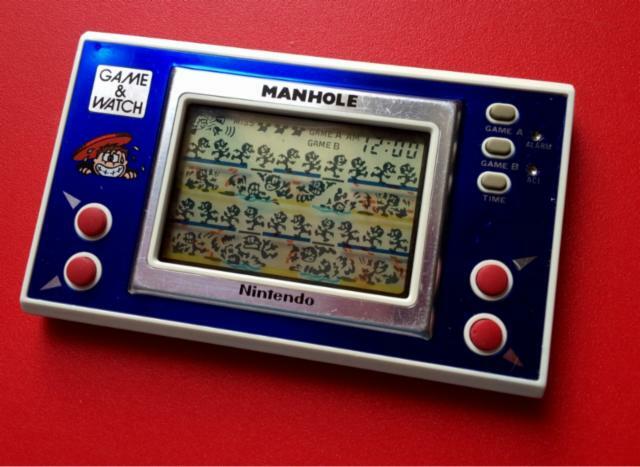 The first Game & Watch game I got was, in fact, Manhole, which my father brought back when I was only three or four years old. I very quickly sent my parents insane with the battery costs for the device, but that was the cost of being a young gamer back in the day. And, after realising how much I enjoyed these things, I ended up with a few more from subsequent overseas trips. In a very real way these devices were formative in establishing my love for gaming. Game & Watch games could only ever be single-screen experiences, as the “shapes” that the game would display had to be literally carved onto the console screen, but as the years went on Nintendo did experiment with more complex game designs. Dual screen machines (a very early indication of what would eventually become the Nintendo DS) gave Nintendo twice the real estate to work with, and this produced some reasonably complex games. One I really liked was Bomb Sweeper, where you would need to work your way through a maze, pushing “walls” in the correct sequence and direction to reach a bomb before the time ran out. Perhaps the most complex one of all was Zelda, in which players would need to fight enemies, collect items, defeat dragon bosses and collect the triforce. Was it Breath of the Wild? No, but it was a remarkable achievement given the extreme limitations that the developers faced. 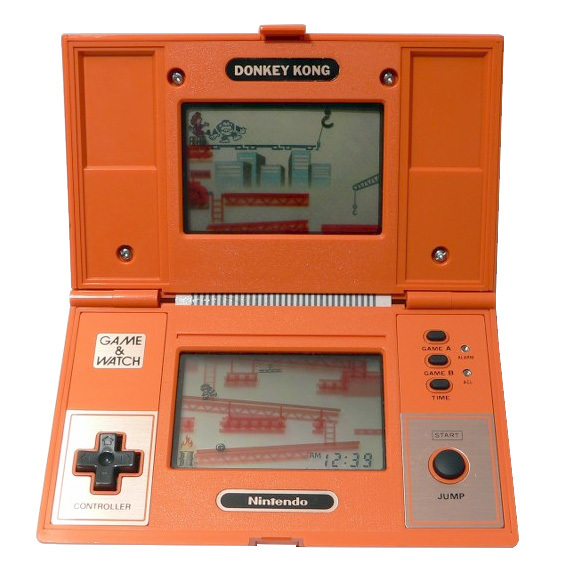 The company also took to create Game & Watch “versions” of many of its popular NES titles; there are also “ports” of Donkey Kong, Super Mario Bros, and Balloon Fight. Indeed, it was the success of these games, and the clear demand for portable Nintendo gaming, that actually encouraged Nintendo to develop the original Game Boy, and kick start the entire handheld gaming phenomenon. Sadly because these games are so simple, Nintendo has subsequently struggled to find compelling ways to keep them alive in the years since. Mario and Zelda have continued going from strength to strength, but poor old Ball and Manhole have not. There were some attempts to collect popular Game & Watch games together for some of the earlier handhelds in the Game & Watch Gallery titles on Game Boy Color and Game Boy Advance. These are great, and you can get them on Virtual Console for your Nintendo 3DS and Wii U, which I recommend you do. In addition to getting workable ports of the original Game & Watch games, you also get full remakes of them, in which Nintendo adds animation, character, colour and even some additional gameplay features. Sadly, these also died away when even the minigame compilations on the DS and later offered more complex gameplay experienced in each individual minigame. The last attempt to remind people of the Game & Watch games (beyond having Mr. Game & Watch in Smash Bros, of course) was a series of “pixel-perfect” ports of the games sold for a pittance through the DSiWare e-Store for Nintendo DSi. The Game & Watch Gallery titles struggled to recreate the crystal-sharp icons that the original Game & Watch games displayed, but these DSiWare downloads were able to near-perfectly recreate the aesthetics of those games, and I truly loved each of those titles. With the Nintendo Switch, one thing I would love for Nintendo to do (but know that it will not) is to take all 50 or so Game & Watch games, package them up in a single game (much like Atari recently did with its old game collections), and sell those pixel-perfect recreations of such classic games as much as a “archive” as a traditional game. Because, for obvious reasons, it’s very difficult to come across Game & Watch games now, and it would be a real pity for Nintendo to allow its oldest heritage in video games fade away completely.